The films of eccentric French writer-director Eugène Green aren’t for every taste—they’re deliberate, declamatory, highly formalized, anti-modern. But those willing to tune into his peculiar wavelength will discover an artist with a sense of humor and a rare mix of sincerity and irony, looking for lost meaning in a busy world. 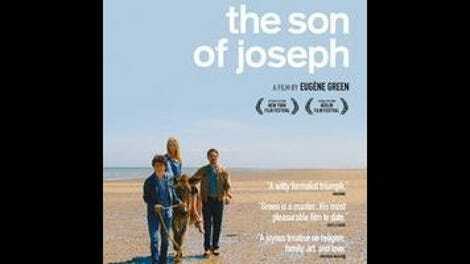 The Son Of Joseph is his most accessible movie to date, though only in terms of narrative: a comedy, almost a farce, about a sulky teenager who goes looking for his supposed biological father, directed in Green’s signature offbeat, Robert Bresson-esque deadpan. The closest thing to his work in American film would be something along the lines of Whit Stillman’s Damsels In Distress or Hal Hartley’s Henry Fool and Ned Rifle (the latter even shares a central theme with The Son Of Joseph), though Green’s films are even less realistic than those exercises in literary archness. An American expat who has called France home since the 1960s, Green taught baroque theater for decades before taking up film, and his movies betray an obsession with earlier forms, mostly baroque and medieval—not just their aesthetics, but also their directness. But here’s the thing: Green’s movies are funny, even when they aren’t, strictly speaking, comedies. Most of them take place in a version of the present imagined in the terms of the distant past, poking fun of modern life by framing it like an anachronism, where waiters and secretaries enter bearing exposition, like nameless servants in an old play. (His 2007 short Correspondances, for example, reimagined email as an early epistolary novel, leading to what is perhaps the definitive Eugène Green image: a MacBook being typed on by candlelight.) Raised by his doting single mother, a nurse named Marie (Natacha Régnier), Vincent (Victor Ezenfis) seems mocked at every turn with references to paternity, from his best friend’s sperm bank racket (“a modern business, artisanal and ecological”) to a café sign that simply reads “Father And Son.” And so, off he goes to discover the identity of his father, which leads him to Oscar Pormenor (Mathieu Amalric), a successful publisher of literary fiction and a complete prick. Oscar specializes in mentoring young writers, all the while ignoring his own legitimate children, whose names he has trouble remembering. When Vincent first tracks him down, it’s at a sparsely attended but very lavish gala for a novel called The Predatory Mother, a farcical sequence in which the young man gets mistaken for a rising literary star by a dim critic (Maria De Medeiros, best known as Butch’s girlfriend in Pulp Fiction). It so happens that Oscar also has an estranged, sweet-natured brother named Joseph (Fabrizio Rongione, who played a different kind of father figure in Green’s La Sapienza), who takes a liking to Vincent after a chance meeting in the lobby of a hotel. Green’s pursuit of purity is also a pursuit of symmetry, and like most of his films, The Son Of Joseph blurs the line between running gags and symbolic motifs, whimsical parodies and allegories. (The film’s use of Christian imagery is self-effacing, complete with a donkey and chapter headings like “The Golden Calf” and “The Flight Into Egypt.”) It’s overlong, but behind its jabs at literary pretension, droll punchlines, and minimalist sight gags lies a search for the kind of guidance that parables used to impart.